Protect Gravehold from invaders! In this cooperative game, two players face nemesis with great spells and exclusive abilities by building a deck that will never be mixed. Collect gems as well as relics and manipulate the gaps to repel every single enemy! But watch out for the exhaustion of your team! 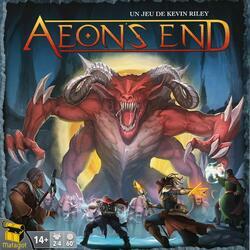 Aeon's End is an immersive game that will introduce you to a post-apocalyptic fantasy world. Will you be able to face the nemesis? Aeon's End was funded on the Crowdfunding Kickstarter (See the campaign) platform on the 06 May 2016, the campaign lasted 30 days. 2,814 people helped funded the game, whose the amount requested was $30,000.00. Thanks to these 2,814 people the game could be funded up to $189,714.70, ~632.38%.